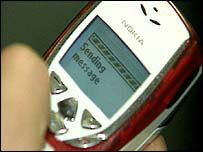 A Cambridgeshire hospital is sending its patients text messages to remind them about their appointments. The new mobile messaging scheme, which is being trialled at Addenbrooke's Hospital's dermatology clinic in Cambridge, has already helped to cut the number of missed appointments. Patients, who are invited to register for the scheme, receive a text message four days before their appointment, reminding them of the date and time. Ade Adigun-Harris, service delivery manager for dermatology, said the idea had reduced missed appointments by half, to 4% of new patient sessions. "Because some of our sessions are booked for 40 minutes, this meant that a lot of valuable clinic time was wasted," he said. "Introducing initiatives such as the text messaging service, as well as a scheme where new patients can phone and book an appointment time to suit them, has reduced our missed new appointments rate by half." When patients receive a text message they also have the option to change their appointment if they are unable to make the original time. Mr Adigun-Harris added: "The scheme has been easy to set up and economical to run - each text costs less than a second class stamp and uses hardly any manpower. "We hope that if the trial is successful we might be able to extend it to follow-up appointments and even to remind people to take their medication at certain times."